This entry was posted in Uncategorized and tagged funky carolina, handspinning, silk/merino. Bookmark the permalink. annnnnnd now that song is stuck in my head. “delighting in your company”… beautiful yarn! You are spinning the most “delightful” yarns. I just love them all. I hear you about the state being broke. My daughter is trying to finish her MSN in New Jersey which is experiencing similar problems. She couldn’t get her classes, either. I live in Central NY and our state is also broke. I wish I could tell you it’s going to get better. I am fortunate to work in one aspect of public education that seems to be well-funded for now, a technical high school system. 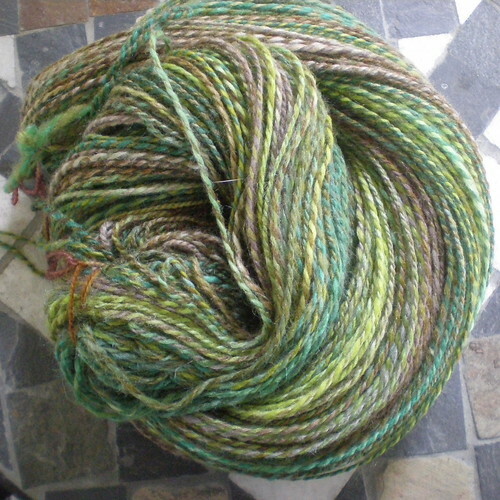 Thank goodness people still buy handspun yarn and soap. Good luck to you.